Guinness was born at 155 Lauderdale Mansions South, Lauderdale Road, Maida Vale, as Alec Guinness de Cuffe. His mother's maiden name was Agnes Cuff. She was born 8 December 1890 to Edward Cuff and Mary Ann Benfield. On Guinness's birth certificate, the space for the mother's name shows Agnes de Cuffe. The space for the infant's name (where first names only are given) says Alec Guinness. The column for name and surname of father is blank. The identity of Guinness's father has never been officially confirmed. From 1875, under English law, when the birth of an illegitimate child was registered, the father's name could be entered on the certificate only if he were present and gave his consent. Guinness himself believed that his father was a Scottish banker, Andrew Geddes (1861–1928), who paid for Guinness's public school education at Fettes College. Geddes occasionally visited Guinness and his mother, posing as an uncle. Guinness's mother later had a three-year marriage to a Scottish army captain named Stiven; his behaviour was often erratic or even violent. Guinness first worked writing advertising copy. His first job in the theatre was on his 20th birthday, while he was still a drama student, in the play Libel, which opened at the old King's Theatre, Hammersmith, and then transferred to the Playhouse, where his status was raised from a walk-on to understudying two lines, and his salary increased to £1 a week. He appeared at the Albery Theatre in 1936 at the age of 22, playing the role of Osric in John Gielgud's successful production of Hamlet. Also in 1936, Guinness signed on with the Old Vic, where he was cast in a series of classic roles. In 1939, he took over for Michael Redgrave as Charleston in a road-show production of Robert Ardrey's Thunder Rock. At the Old Vic, Guinness worked with many actors and actresses who would become his friends and frequent co-stars in the future, including Gielgud, Ralph Richardson, Peggy Ashcroft, Anthony Quayle, and Jack Hawkins. An early influence was film star Stan Laurel, whom Guinness admired. Guinness continued playing Shakespearean roles throughout his career. In 1937, he played Aumerle in Richard II and Lorenzo in The Merchant of Venice under the direction of John Gielgud. He starred in a 1938 production of Hamlet which won him acclaim on both sides of the Atlantic. He also appeared as Romeo in a production of Romeo and Juliet (1939), Sir Andrew Aguecheek in Twelfth Night, and as Exeter in Henry V in 1937, both opposite Laurence Olivier, and Ferdinand in The Tempest, opposite Gielgud as Prospero. In 1939, he adapted Charles Dickens' novel Great Expectations for the stage, playing Herbert Pocket. The play was a success. One of its viewers was a young British film editor, David Lean, who would later have Guinness reprise his role in Lean's 1946 film adaptation of the play. Guinness served in the Royal Navy Volunteer Reserve in the Second World War, initially as a seaman in 1941, before receiving a commission as a Temporary Sub-lieutenant on 30 April 1942 and a promotion to Temporary Lieutenant the following year. Guinness then commanded a landing craft at the Allied invasion of Sicily, and later ferried supplies and agents to the Yugoslav partisans in the eastern Mediterranean theatre. During the war, he was granted leave to appear in the Broadway production of Terence Rattigan's play, Flare Path, about RAF Bomber Command, with Guinness playing the role of Flight Lieutenant Teddy Graham. Guinness returned to the Old Vic in 1946 and stayed until 1948, playing Abel Drugger in Ben Jonson's The Alchemist, the Fool in King Lear opposite Laurence Olivier in the title role, DeGuiche in Cyrano de Bergerac opposite Ralph Richardson in the title role, and finally starring in an Old Vic production as Shakespeare's Richard II. After leaving the Old Vic, he played Eric Birling in J. B. Priestley's An Inspector Calls at the New Theatre in October 1946. 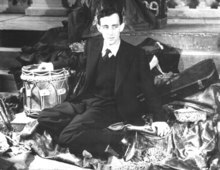 He played the Uninvited Guest in the Broadway production of T. S. Eliot's The Cocktail Party (1950, revived at the Edinburgh Festival in 1968). He played Hamlet under his own direction at the New Theatre in the West End in 1951. Invited by his friend Tyrone Guthrie to join the premiere season of the Stratford Festival of Canada, Guinness lived for a brief time in Stratford, Ontario. On 13 July 1953, Guinness spoke the first lines of the first play produced by the festival, Shakespeare's Richard III: "Now is the winter of our discontent/Made glorious summer by this sun of York." Guinness won a Tony Award for his Broadway performance as Welsh poet Dylan Thomas in Dylan. He next played the title role in Macbeth opposite Simone Signoret at the Royal Court Theatre in 1966. Guinness made his final stage performance at the Comedy Theatre in the West End on 30 May 1989, in the play A Walk in the Woods. In all, between 2 April 1934 and 30 May 1989, he played 77 parts in the theatre. In films, Guinness was initially associated mainly with the Ealing Comedies, and particularly for playing nine characters in Kind Hearts and Coronets. Other films from this period included The Lavender Hill Mob, black comedy The Ladykillers, and The Man in the White Suit, with all three ranked among the Best British films. In 1952, director Ronald Neame cast Guinness in his first romantic lead role, opposite Petula Clark in The Card. In 1951, exhibitors voted him the most popular British star. Other notable film roles of this period included The Swan (1956) with Grace Kelly, in her second-to-last film role; The Horse's Mouth (1958) in which Guinness played the part of drunken painter Gulley Jimson, as well as writing the screenplay, for which he was nominated for an Academy Award; the lead in Carol Reed's Our Man in Havana (1959); Marcus Aurelius in The Fall of the Roman Empire (1964); The Quiller Memorandum (1966); Marley's Ghost in Scrooge (1970); Charles I in Cromwell (1970); Pope Innocent III in Franco Zeffirelli's Brother Sun, Sister Moon (1972) and the title role in Hitler: The Last Ten Days (1973), which he considered his best film performance, though critics disagreed. Another role which is sometimes referred to as one which he considered his best and is so considered by many critics, is that of Colonel Jock Sinclair in Tunes of Glory (1960). Guinness also played the role of Jamessir Bensonmum, the blind butler, in the 1976 Neil Simon film Murder by Death. Guinness won particular acclaim for his work with director David Lean, which today is his most critically acclaimed work. After appearing in Lean's Great Expectations and Oliver Twist, he was given a starring role opposite William Holden in The Bridge on the River Kwai. For his performance as Colonel Nicholson, the unyielding British POW commanding officer, Guinness won an Academy Award for Best Actor and a BAFTA Award for Best Actor. Despite a difficult and often hostile relationship, Lean, referring to Guinness as "my good luck charm", continued to cast Guinness in character roles in his later films: Arab leader Prince Feisal in Lawrence of Arabia; the title character's half-brother, Bolshevik leader Yevgraf, in Doctor Zhivago and Indian mystic Professor Godbole in A Passage to India. He was also offered a role in Lean's Ryan's Daughter (1970) but declined. At that time, Guinness "mistrusted" Lean and considered the formerly close relationship to be strained—although, at his funeral, he recalled that the famed director had been "charming and affable". Guinness appeared in five Lean films that were ranked in the British Film Institute's top 50 greatest British films of the 20th century: 3rd (Lawrence of Arabia), 5th (Great Expectations), 11th (The Bridge on the River Kwai), 27th (Doctor Zhivago) and 46th (Oliver Twist). Guinness's role as Obi-Wan Kenobi in the original Star Wars trilogy, beginning in 1977, brought him worldwide recognition to a new generation, as well as Academy Award and Golden Globe nominations. In letters to his friends, Guinness described the film as "fairy tale rubbish" but the film's sense of moral good – and the studio's doubling of his initial salary offer – appealed to him and he agreed to take the part of Kenobi on the condition that he would not have to do any publicity to promote the film. He negotiated a deal for 2.25% of the gross royalties paid to the director, George Lucas, who received one-fifth of the box office takings. This made him very wealthy in his later life. Upon his first viewing of the film, Guinness wrote in his diary, "It's a pretty staggering film as spectacle and technically brilliant. Exciting, very noisy and warm-hearted. The battle scenes at the end go on for five minutes too long, I feel, and some of the dialogue is excruciating and much of it is lost in noise, but it remains a vivid experience." Guinness soon became unhappy with being identified with the part and expressed dismay at the fan following that the Star Wars trilogy attracted. In the DVD commentary of the original Star Wars, Lucas says that Guinness was not happy with the script rewrite in which Obi-Wan is killed. Guinness said in a 1999 interview that it was actually his idea to kill off Obi-Wan, persuading Lucas that it would make him a stronger character and that Lucas agreed to the idea. Guinness stated in the interview, "What I didn't tell Lucas was that I just couldn't go on speaking those bloody awful, banal lines. I'd had enough of the mumbo jumbo." He went on to say that he "shrivelled up" every time Star Wars was mentioned to him. Although Guinness disliked the fame that followed work he did not hold in high esteem, Lucas and fellow cast members Mark Hamill, Harrison Ford, Kenny Baker, Anthony Daniels and Carrie Fisher have spoken highly of his courtesy and professionalism, on and off the set. Lucas credited him with inspiring cast and crew to work harder, saying that Guinness contributed significantly to achieving completion of the filming. Guinness was quoted as saying that the royalties he obtained from working on the films gave him "no complaints; let me leave it by saying I can live for the rest of my life in the reasonably modest way I am now used to, that I have no debts and I can afford to refuse work that doesn't appeal to me." In his autobiography, Blessings In Disguise, Guinness tells an imaginary interviewer "Blessed be Star Wars", regarding the income it provided. In the final volume of the book A Positively Final Appearance (1997), Guinness recounts grudgingly giving an autograph to a young fan who claimed to have watched Star Wars over a hundred times, on the condition that the boy promise to stop watching the film because "this is going to be an ill effect on your life". The fan was stunned at first but later thanked him (though some sources say it went differently). Guinness is quoted as saying: "'Well', I said, 'do you think you could promise never to see Star Wars again?' He burst into tears. His mother drew herself up to an immense height. 'What a dreadful thing to say to a child!' she barked, and dragged the poor kid away. Maybe she was right but I just hope the lad, now in his thirties, is not living in a fantasy world of second hand, childish banalities." Guinness grew so tired of modern audiences apparently knowing him only for his role of Obi-Wan Kenobi that he would throw away the mail he received from Star Wars fans without reading it. Guinness was reluctant to appear on television, but accepted the part of George Smiley in the serialisation of John le Carré's Tinker Tailor Soldier Spy (1979) after meeting the author. Guinness reprised the role in Smiley's People (1982), and twice won the British Academy Television Award for Best Actor for his portrayal of the character. Le Carré was so impressed by Guinness's performance that he based his characterisation of Smiley in subsequent novels on him. One of Guinness's last appearances was in the BBC drama Eskimo Day (1996). Guinness won the Academy Award for Best Actor and the BAFTA Award for Best Actor in 1957 for his role in The Bridge on the River Kwai after having been unsuccessfully nominated for an Oscar in 1952 for his performance in The Lavender Hill Mob. He was nominated in 1958 for the Academy Award for Best Writing, Screenplay Based on Material from Another Medium, for his screenplay adapted from Joyce Cary's novel The Horse's Mouth. He was nominated for Academy Award for Best Supporting Actor for his role as Obi-Wan Kenobi in Star Wars in 1977. He received an Academy Honorary Award for lifetime achievement in 1980. In 1988, he received an Academy Award nomination for Best Supporting Actor for Little Dorrit. He received the BAFTA Academy Fellowship Award for lifetime achievement in 1989. For his theatre work, he received an Evening Standard Award for his performance as T. E. Lawrence in Ross and a Tony Award for his Broadway turn as Dylan Thomas in Dylan. Guinness received a star on the Hollywood Walk of Fame at 1559 Vine Street on 8 February 1960. Guinness was appointed a Commander of the Order of the British Empire (CBE) in the 1955 Birthday Honours, and was knighted by Elizabeth II in the 1959 New Year Honours. In 1991, he received an honorary doctorate from Cambridge University. Guinness was appointed a Companion of Honour in the 1994 Birthday Honours for services to Drama. Guinness married the artist, playwright, and actress Merula Sylvia Salaman (1914–2000) in 1938; in 1940, they had a son, Matthew Guinness, who later became an actor. From the 1950s the family lived at their home Kettlebrook Meadows, near Steep Marsh in Hampshire. The House itself was designed by Merula's brother Eusty Salaman. In his biography, Alec Guinness: The Unknown, Garry O'Connor reports that Guinness was arrested and fined 10 guineas (£10.50) for a homosexual act in a public lavatory in Liverpool in 1946. Guinness is said to have avoided publicity by giving his name to police and court as "Herbert Pocket", the name of the character he played in Great Expectations. No record of any arrest has ever been found, however. Piers Paul Read, in his 2003 biography, suggests "The rumour is possibly a conflation of stories about Alec's 'cottaging' and the arrest of John Gielgud, in October 1953, in a public lavatory in Chelsea after dining with the Guinnesses at St. Peter's Square." This suggestion was not made until April 2001, eight months after his death, when a BBC Showbiz article related that new books claimed that Guinness was bisexual and that he had kept his sexuality private from the public eye and that the biographies further said only his closest friends and family members knew he had sexual relationships with men. While serving in the Royal Navy, Guinness had planned to become an Anglican priest. In 1954, while he was filming Father Brown in Burgundy, Guinness, who was in costume as a Catholic priest, was mistaken for a real priest by a local child. Guinness was far from fluent in French, and the child apparently did not notice that Guinness did not understand him but took his hand and chattered while the two strolled; the child then waved and trotted off. The confidence and affection the clerical attire appeared to inspire in the boy left a deep impression on the actor. When their son was ill with polio at the age of 11, Guinness began visiting a church to pray. A few years later in 1956, Guinness converted to the Roman Catholic Church. His wife, who was of paternal Sephardi Jewish descent, followed suit in 1957 while he was in Sri Lanka filming The Bridge on the River Kwai, and she informed him only after the event. Every morning, Guinness recited a verse from Psalm 143, "Cause me to hear your loving kindness in the morning". Guinness died on the night of 5 August 2000, from liver cancer, at Midhurst in West Sussex. He had been receiving hospital treatment for glaucoma, and had recently also been diagnosed with prostate cancer. 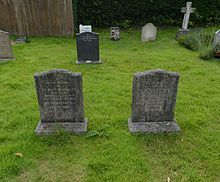 He was interred at Petersfield, Hampshire. Guinness wrote three volumes of a best-selling autobiography, beginning with Blessings in Disguise in 1985, followed by My Name Escapes Me in 1996, and A Positively Final Appearance in 1999. He recorded each of them as an audiobook. Shortly after his death, Lady Guinness asked the couple's close friend and fellow Catholic, novelist Piers Paul Read, to write Guinness's official biography. It was published in 2002. 1936 Love's Labour's Lost Boyet The Old Vic Start of a season with the Old Vic Company; September 1936-April 1937. 1937 Richard II Aumerle and The Groom Queen's Theatre Start of a Season with John Gielgud's Company at the Queen's Theatre, September 1937-May 1938. 1938 Trelawny of the Wells Arthur Gower The Old Vic Start of a Season with the Old Vic Company. September to December 1938. 1939 Hamlet Hamlet The Old Vic Start of Tour of Europe and Egypt with the Old Vic Company. January to April 1939. 1939 Great Expectations Herbert Pocket Rudolf Steiner Hall Version adapted by Guinness from Charles Dickens novel; Performed by The Actor's Company, a group Guinness had formed with George Devine and Marius Goring. 1940 Flare Path Fl. Lt. Graham Henry Miller's Theatre, New York City, United States Was temporarily released from his war service to perform in this production. 1946 The Brothers Karamazov Mitya Lyric Theatre Adapted by Guinness from Fyodor Dostoevsky. 1946 King Lear The Fool New Theatre Start of a Season with the Old Vic Company at the New Theatre. September 1946 – May 1947. 1947 Richard II Richard II New Theatre Start of a Season with the Old Vic Company at the New Theatre. September 1947-May 1948. 1948 Twelfth Night - New Theatre Director only for the Old Vic Company at the New Theatre. September 1948. 1949 The Cocktail Party Sir Henry Harcourt-Reilly Royal Lyceum Theatre, Edinburgh, Scotland. 1951 Hamlet Hamlet New Theatre This production was also directed by Guinness. 1953 Richard III Richard III Stratford Festival, Stratford, Ontario, Canada Start of a Season at the Stratford Festival. July to September 1953. 1968 The Cocktail Party Sir Henry Harcourt-Reilly Chichester Festival Theatre, Chichester, Sussex, Wyndham's Theatre, Theatre Royal Haymarket Production was also directed by Guinness. 1970 Time out of Mind John Yvonne Arnaud Theatre, Guildford, Surrey. 1976 Yahoo Dean Swift Queen's Theatre Adapted by Guinness from the works of Jonathan Swift. ^ GRO Register of Births: June 1914 1a 39 Paddington – Alec Guinness De Cuffe, mmn = De Cuffe. ^ a b "Alec Guinness." Hollywood Walk of Fame (Hollywood Chamber of Commerce, Hollywood, California), 2011. Retrieved: 22 June 2011. ^ "Alec Guinness biography." MSN Movies. Retrieved: 29 July 2007. ^ Read, Piers Paul. Alec Guinness: The Authorised Biography. New York: Simon & Schuster, 2005. ISBN 978-0-7432-4498-5. ^ "Sir Alec Guinness". The Telegraph. UK. 8 August 2000. Archived from the original on 8 July 2013. Retrieved 8 July 2013. ^ "Guinness: The black stuff", guardian.co; retrieved 8 April 2012. ^ Extracts from Guinness's Journals, The Daily Telegraph, 20 March 1999. ^ On 3 June 1961, Guinness sent a letter to Stan Laurel Archived 11 December 2006 at the Wayback Machine, acknowledging that he must have unconsciously modeled his portrayal of Sir Andrew Aguecheek as he imagined Laurel might have done. Guinness was 23 at the time he was performing in Twelfth Night, so this would have been around 1937, by which time Laurel had become an international movie star. ^ "NY Times: Great Expectations". NY Times. Retrieved 26 October 2017. ^ Houterman, J.N. "Royal Naval Volunteer Reserve (RNVR) Officers 1939–1945", Unithistories.com; retrieved 7 March 2010. ^ "No. 35561". The London Gazette. 15 May 1942. p. 2127. ^ "No. 36096". The London Gazette. 16 July 1943. p. 3235. ^ "'Fleming': 10 Famous Brits Who Were Heroes In World War II". BBC America. 25 October 2017. ^ "Theatre Obituaries: Sir Alec Guinness", Telegraph.co.uk, 8 August 2000; retrieved 22 February 2011. ^ McCarten, John. "Eliot and Guinness." The New Yorker, Volume 25, Issue 50, 1950, pp. 25–26. ^ Taylor 2000, pp. 133–134. ^ Alec Guinness, Journals, November 1998. ^ a b "Vivien Leigh Actress of the Year." Townsville Daily Bulletin, via National Library of Australia, 29 December 1951, p. 1. Retrieved: 24 April 2012. ^ Canby, Vincent. "Screen: 'Last Ten Days': Guinness Plays Hitler in Bunker Episode, The Cast." The New York Times, 10 May 1973. ^ Guinness 1998, pp. 90–91. ^ Selim, Jocelyn. "Alec Guinness: Reluctant Intergalactic Icon." Cancer Today magazine, Spring 2012. ^ a b Read 2005, p. 507. ^ "Alec Guinness Blasts Jedi 'Mumbo Jumbo'", 8 September 1999. ^ Guinness 1986, p. 214. ^ Guinness 2001, p. 11. ^ "The shy introvert who shone on screen." The Guardian, 7 August 2000. ^ le Carré, John (8 March 2002). Tinker Tailor Soldier Spy: A Conversation with John le Carré (DVD). Disc 1. ^ "BFI Screenonline: Eskimo Day (1996)". Screenonline.org.uk. Retrieved 13 May 2014. ^ "BBC Four - Eskimo Day". BBC. 11 January 2009. Retrieved 13 May 2014. ^ Taylor 2000, p. 131. ^ "Honorary Degrees conferred from 1977 till present." Cambridge University, 18 December 2008. ^ Chambers 2002, p. 334. ^ Read, Piers Paul. Alec Guinness, The Authorised Biography. Simon & Schuster. pp. 256–258. ISBN 978-0-7432-4498-5. ^ "Obituary: Lady Guinness". Daily Telegraph. ^ Read, Piers Paul. Alec Guinness, The Authorised Biography. Simon & Schuster. p. 249. ISBN 978-0-7432-4498-5. ^ "Sir Alec Guinness was bisexual." BBC News (Showbiz), 16 April 2001. Retrieved: 24 August 2009. ^ Pearce 2006, p. 301. ^ "Sir Alec Guinness." Telegraph (Obituaries), 8 August 2000. Retrieved: 26 August 2009. ^ Sutcliffe, Tom. "Sir Alec Guinness (1914–2000)." The Guardian, 7 August 2000. Retrieved: 26 August 2009. ^ Garry O'Connor (2002). Alec Guinness: A Life (illustrated ed.). Applause Theatre & Cinema Books. p. 89. ISBN 9781557835741. ^ Pearce 2006, p. 311. ^ The invisible man, by Hugh Davies, originally published in the Daily Telegraph and reprinted in The Sunday Age, 13 August 2000. 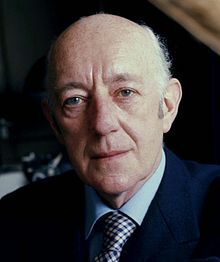 ^ GRO Register of Deaths: AUG 2000 1DD 21 Chicester– Alec Guinness, DoB = 2 April 1914, aged 86. ^ Taylor 2000, pp. 185-190. ^ O'Connor 2002, pp. 409-418. ^ "Vicious Circle - cast and crew". theatricalia.com. ^ "Comedian tops film poll." The Sunday Herald (Sydney, NSW: 1949–1953), via National Library of Australia, 28 December 1952, p. 4. Retrieved: 27 April 2012. ^ "The Most Popular Film Star In Britain." Times [London, England] 7 December 1956, p. 3 via The Times Digital Archive.. Retrieved: 11 July 2012. ^ "Mr. Guinness Heads Film Poll." Times [London, England], 2 January 1959, p. 4 via The Times Digital Archive. Retrieved: 11 July 2012. ^ "Year Of Profitable British Films." Times [London, England] 1 January 1960, p. 13 via The Times Digital Archive. Retrieved: 11 July 2012. Guinness, Alec. A Positively Final Appearance: A Journal, 1996–1998. London: Penguin Books, 2001. ISBN 978-0-14-029964-9. Guinness, Alec. Blessings in Disguise. New York: Knopf. ISBN 0394552377. O'Connor, Garry. Alec Guinness: The Unknown London: Sidgwick & Jackson, 2002. ISBN 0-283-07340-3. Wikimedia Commons has media related to Alec Guinness.